I remember many years ago traveling out to Greenport, L.I. to do a little fishing. We went out to catch blue fish and we hauled them in until the buckets were quite full. Much of fishing today involves not only going where the fish are but being downright deceptive. Hence the words "bait" and "lure." We actually try to trick the fish into believing that what they are biting on is something that it isn't. Jesus went to where the fish were, but once there, cast a net and grabbed them. No deception. No tricks. No lures. Just a net, and the bigger and wider -- the better. 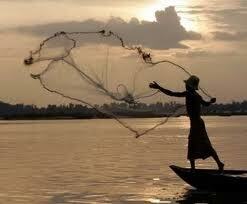 Now if we're going to reel in disciples, we've got to cast a wide net. This means taking another look at how we nurture the souls of today's world. Researchers have found that what many baby boomers are looking for are high-quality youth programs, uplifting worship experiences, and meaningful, authentic small group experiences. So what should we offer the souls that swim by us? Contemporary praise songs and drama in worship? Special ministries for singles, children and youths? Computer courses, with a chance to work on the web site? Saturday prayer groups and Wednesday evening classes, as well as dance lessons? Don't laugh -- some are doing it, and they're netting people for Christ! Fortunately, our call is to hook people for the most life-enhancing and soul-expanding of reasons: a connection with Jesus Christ. We are reeling in disciples to get people online with the Divine, and to introduce them personally to the Source of salvation.